Uncut Pair of (2) Friedberg Unlisted (W-Unlisted). 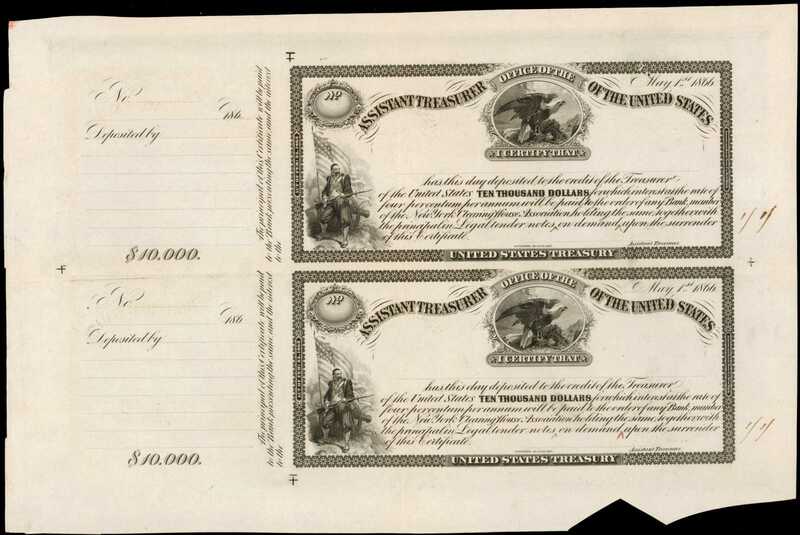 Act of February 25, 1862 $10,000 Treasury Certificate of Deposit. PCGS Currency Extremely Fine 40. Face Proofs.Hessler-Unlisted. Imprint of the American Bank Note Co. New-York. India paper only. The black and white portions only, no color protectors. Style as last. Under titles, The Eagles Nest (by Delnoce). Lower left, Zouave by F.O.C. Darley (engraved by Pease). Complex obligation across with engraved denomination across top center. Top title, "Assistant Treasurer Office of the United States without color location. Left side stubs on each. Similar to plated Designated Depositary $10,000. This is an important proof from the American Banknote Co. archives. The corrections placed on the color specimen previously were implemented on this plate for the next series. A bold pair of proofs. Included is an archive letter that came with the Christies lot. PCGS Currency mentions "Small Internal Tear at Top Right" in the comments section of the holder.pDated May 1, 1866, or a year after the end of the Civil War. During the war it was hoped that the federal currency and loan situation would return to normal, but this did not happen. In a semi-related context, Legal Tender Notes did not achieve par with silver coins until April 1876 and not with gold coins until December 1878.pFrom our November 23, 2012 Baltimore Whitman Expo Sale, lot 5436; Christies sale of the Hon. J. W. Middendorf II Collection, March 22, 1994, part of lot 168; Christies Important World Bank Notes and Artwork from the Archives of the American Bank Note Company sale, November 28-29, 1990, part of lot 1224.